Well what a month February has been! Valentines was exceptionally busy this year, and then I got quite ill which knocked me out for about a week. But I still manage to craft all your card orders on time (somehow!). So what am I up to now that I’m fighting fit? Well, I’m currently working on mother’s day. I’m introducing more colours choices on some of the card designs, which will hopefully give you the chance to not only present your messages of love and support to your mum, but also maybe her favourite colour too. 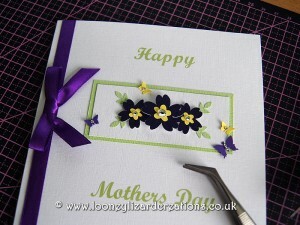 I’m also working on an additional luxury mother’s day card design which will hopefully be released early next week and something else which I had hoped to do for Valentines, but unfortunately didn’t manage to finish in time….hmmm what could it be? Anyway here’s a little snapshot of the purple version of my design primrose that I’m currently working on. All new colour choices should be available from Monday 3rd March. This entry was posted in Looney News and tagged news, mothers day, mothering sunday on February 28, 2014 by Sherrie.